Still think there's no money in spreading global warming alarmism? Well, how'd you like to make $1,200 just for shaking someone's hand and having your picture taken with the sycophant? This is what Al "I'm Only Doing This To Save The Planet" Gore is charging for such an honor at next week's climate change conference in Copenhagen. "Meet Al Gore in Copenhagen." The official announcement from this fair Danish city says it all. The former vice president is getting star treatment when he arrives with an entire swarm of green-minded gadflies for the United Nations' global warming extravaganza, which begins on Dec. 7. This is the book, on which Al Gore will base his lecture, when he invites Copenhageners and visitors to hear him speak about what can be done to solve the serious problems of climate change. Tickets are available in different price ranges for the event. If you want it all, you can purchase a VIP ticket, where you get a chance to shake hands with Al Gore, get a copy of Our Choice and have your picture taken with him. The VIP event costs DKK 5,999 and includes drinks and a light snack. If you do not want to spend that much money, but still want to hear Al Gore speak about his latest book about climate challenges, you can purchase general tickets, ranging in price from DKK 199 - 1,499 depending on where in the room you want to sit. There will be large screens, so that everyone will get a good view. How much is DKK 5,999? Well, according to TheMoneyConverter.com, a Danish Krone is currently worth 20.22 cents. That means 5,999 Krones is about $1,213. So, if Big Al can shake your hand and get his picture taken with you in a minute, he'll make almost $73,000 an hour. 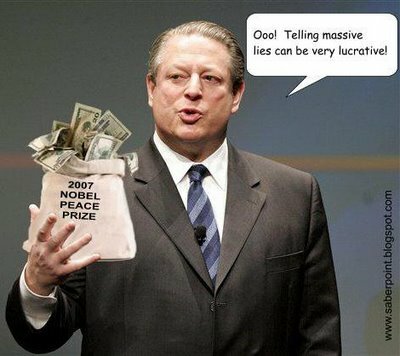 Of course, no one knows what the house is getting per ticket or if Gore is donating his take -- whatever that is! -- to charity. On the other hand, if his share goes to HIS charity, that's better than it going to him for then he gets to control all the proceeds without paying one cent in taxes. That REALLY is nice work if you can get it.